L-R Back Ellie Lammiman (Hull) Sophie Woolston (Hull), Front Holly Hunt (Stockport) and Olivia Ward (West Mids). 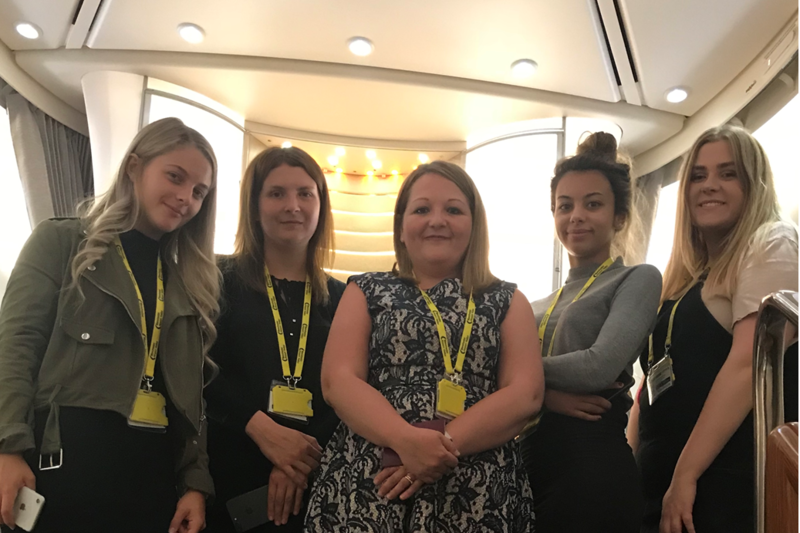 Good Travel Management's Apprentice Business Travel Consultants were given the opportunity to experience the Emirates A380 Aircraft in order to improve their knowledge. The day provided an overview of the Emirates flight operations at Manchester Airport, along with a behind the scenes tour of the Emirates product and services provided to passengers. The day commenced with an of an overview of the check-in operations, followed by the A380 Aircraft tour, a spot of lunch at The Giraffe World Kitchen and a tour of the Emirates Business Lounge for refreshments. Once the Emirates tour had ended, the group then visited The Radisson Blu Manchester Airport for a site inspection where they got to sample the different room types and meeting space as well as the fabulous executive lounge. The Radisson Blu is the only hotel at Manchester Airport that is connected to Manchester Airport’s Skylink walkway, a covered moving pedestrian system connecting terminals 1 and 2 and the train station. All three airport terminals can be reached in less than 15 minutes when you step out of the hotel and onto the covered walkway. Emirates connect to over 150 destinations in six continents with a fleet that is among the most technologically advanced in the sky. Operating the world's largest fleet of the double-decker Airbus A380 and the ultra-long-range Boeing 777. FACT: Emirates operate x3 A380 wide bodied aircraft on its services from Manchester to Dubai with the A380 being the largest commercial airliner in the skies. 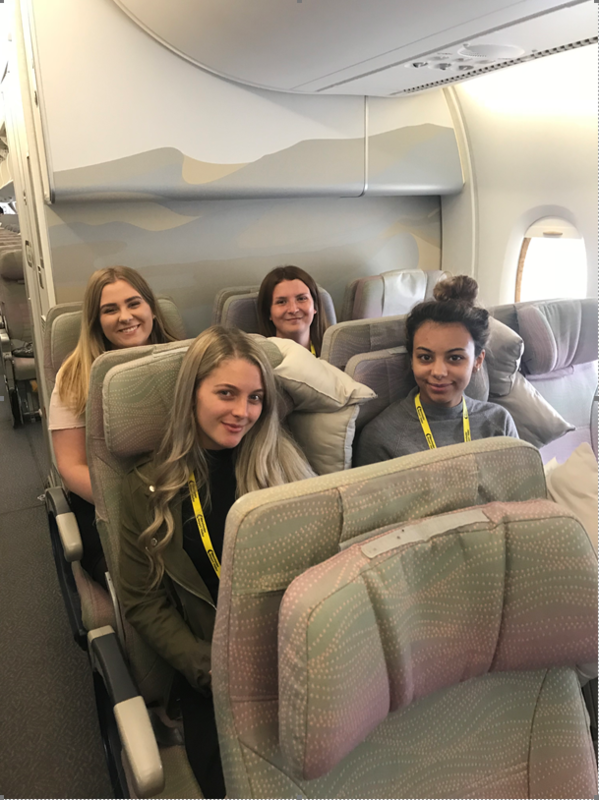 Looks like the girls had an educational day soaking up all Emirates has to offer its guests on-board and off the aircraft and are ready to pass on their knowledge to our clients booking with the airline.